Inspired by geometric design, this Fairtrade 9 carat white gold eternity ring has been set with nine round brilliant cut diamonds. Interlocking lines create three hexagonal sections, each of which has been thread and grain set with three diamonds. The eye catching stones are G-H in colour, VS1-2 in clarity and have a total weight of 0.12ct. 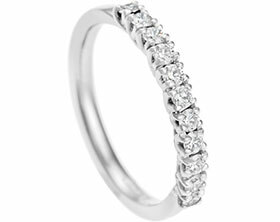 The 3mm wide band has been given a polished finish which further enhances the sparkle of the diamonds. Size N (approx US size 7). This ring can be resized within approx 2-3 sizes or please enquire if a further resize is required.